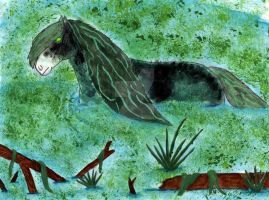 It's a supernatural water horse from Celtic folklore that is believed to haunt the rivers and lochs of Scotland and Ireland. 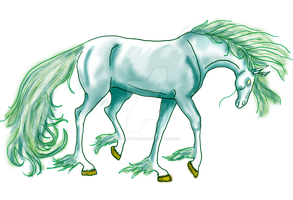 It can be white or black, but I suppose white horse to be more beautiful. Even in human form, they are always dripping wet and/or have water weeds in their hair. This is simply beautiful!! I'm a big fan of Kelpies *points to name*, and I love this so much!